Meta-analyses have reported a small but positive association between diabetes and postmenopausal breast cancer risk, with summary relative risks of approximately 1.15. 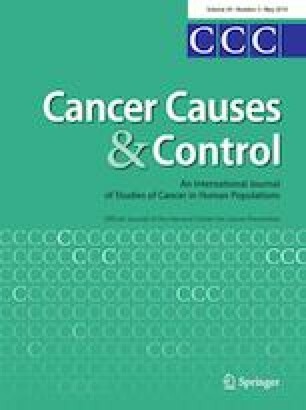 We analyzed data from the Southern Community Cohort Study (SCCS) following an underserved population with high diabetes prevalence to prospectively examine whether diabetes was associated with subsequent postmenopausal breast cancer risk and whether obesity modified this effect. Women with incident breast cancer were identified through linkage with state cancer registries and the National Death Index (213 white, 418 black cases). Person-years were calculated from date of entry into the SCCS until the earliest of date of breast cancer diagnosis, date of death, or date of last follow-up (8,277 white, 16,458 black noncases). Data on diabetes diagnosis were obtained through baseline and follow-up surveys. Cox regression was applied to examine the association between diabetes and postmenopausal breast cancer risk. After adjustment for confounding, there was no association between self-reported diabetes and postmenopausal breast cancer risk among white (hazard ratio [HR] 1.02, 95% confidence interval [CI] 0.75–1.40) or black (HR 1.00, 95% CI 0.81–1.22) women. Nor was there evidence that obesity modified the effect of diabetes on postmenopausal breast cancer in women of either race. We found no evidence of the hypothesized increased risk of breast cancer among women with diabetes. The breast cancer risks among those with diabetes in this population suggest that the association between these two illnesses is complex. The Southern Community Cohort Study was supported by the National Cancer Institute (Grants R01 CA092447 and U01 CA202979). Dr. Warren Andersen is supported by R00 CA207848. Data collection performed by the Survey and Biospecimen Shared Resource is supported in part by the Vanderbilt-Ingram Cancer Center (P30 CA68485).